The Recordkeeping Roundtable is pleased to announce its next event: Where do old websites go to die?, with Jason Scott, founder of the US based, self described ‘loose coalition of rogue archivists, programmers, writers and loudmouths’, Archive Team. Many of us in the recordkeeping community are acutely aware of the problems attending institutional website “archiving” but the problems of preservation in the wider web world are on another scale of magnitude. Nonetheless there are brave and hardy souls out there who have taken up the task. Jason Scott is visiting Sydney in June and we have invited him to present his cause and methodology to us. In this session we’ll hear from Jason about his work, followed by a Q&A session led by Cassie Findlay. We hope to explore the role and nature of community driven archives, appraisal in the online world and how our understandings of archives and archival practice may need to evolve to keep up with technology. Jason Scott is the founder and in-house loudmouth for Archive Team, a loose coalition of concerned data hoarders dedicated to saving as much of online user-created content as possible. Sometimes he steers this pirate ship of fools as they rescue heritage from dying corporate fad sites, and sometimes the ship steers him. In the last half-decade, his strongest and most-followed voice is that of his cat, Sockington (@Sockington on Twitter). 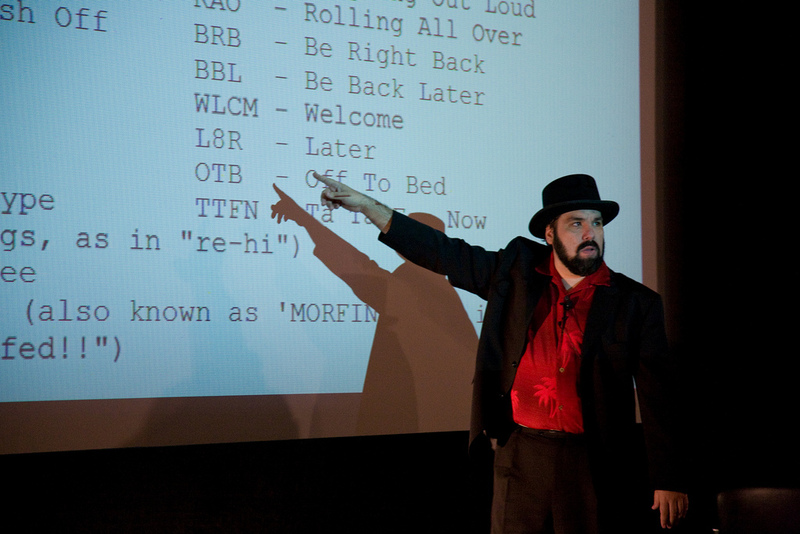 He is also the founder of textfiles.com, a collection of Bulletin-Board-System-era writings and files, and creator of two documentaries about aspects of computer history, GET LAMP and BBS: THE DOCUMENTARY. Archive Team – http://www.archiveteam.org – is a loose collective of rogue archivists, programmers, writers and loudmouths dedicated to saving our digital heritage. Since 2009 this variant force of nature has caught wind of shutdowns, shutoffs, mergers, and plain old deletions – and done our best to save the history before it’s lost forever. Along the way, we’ve gotten attention, resistance, press and discussion, but most importantly, we’ve gotten the message out: IT DOESN’T HAVE TO BE THIS WAY. This website is intended to be an offloading point and information depot for a number of archiving projects, all related to saving websites or data that is in danger of being lost. Besides serving as a hub for team-based pulling down and mirroring of data, this site will provide advice on managing your own data and rescuing it from the brink of destruction. With thanks to our sponsors, ATP Innovations. This entry was posted in Update and tagged archives, websites. Bookmark the permalink. brilliant as always. can we clone you?